James was the son of Samuel and Martha Croston and was born at Hulme in Manchester where he was baptised on 7 Nov 1830. In 1841 James and his widowed mother were living in Paradise, Salford. He seems to have done well for himself. He was a Commercial Clerk And Author in 1861 but ten years later, living at Cheetham, he was employed as a Ship & Insurance Broker. By 1874 he and his family were living at Upton Hall, Prestbury, near Macclesfield and he became a Magistrate, whilst continuing his work as an Insurance Broker and a patentee of the Fire Annihilator Company. He later became a political agent (1891). He wrote and edited several books, mostly about Lancashire and Cheshire history and individual buildings. His interest in Derbyshire included "A Pilgrimage to the Home of Florence Nightingale" (1862). 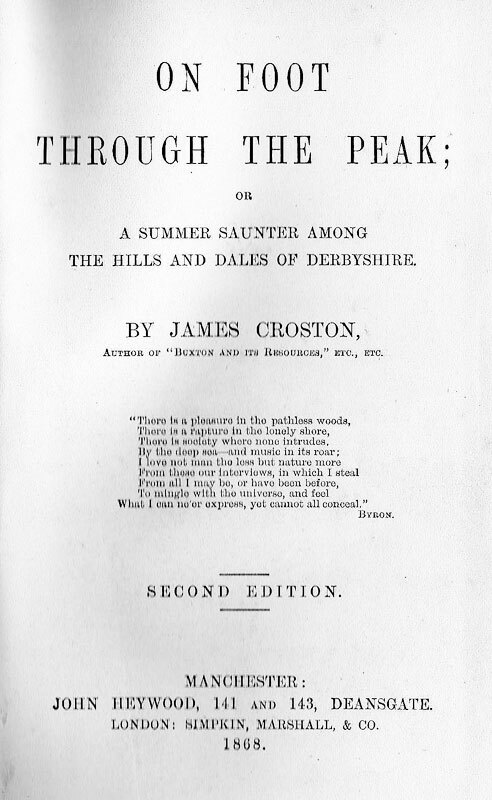 He also wrote historical and topographical descriptions for "Chantrey's Peak Scenery or Views in Derbyshire" (1889). Chantrey's engravings had been first been published as part of Ebenezer Rhodes "Peak Scenery" (pub 1817, 1819, 1822, 1823). The transcripts on these pages include an interesting perambulation around Matlock Bath which refers to the people seen on the street as well as the usual buildings and scenery.